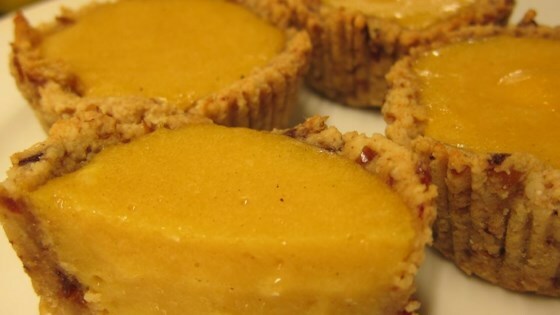 "These lemon tarts are a delicious paleo-style treat." Preheat oven to 350 degrees F (175 degrees C). Line 4 muffin cups with paper liners. Blend together almond meal, 3 tablespoons lemon juice, and dates in a food processor. Press mixture firmly into bottoms and up sides of prepared muffin cups to make crusts. Bake in the preheated oven until crusts are lightly golden brown, 10 to 12 minutes. Heat 6 tablespoons lemon juice, lemon zest, and honey in a saucepan over low heat; simmer for 2 minutes. Beat eggs in a bowl. While mixture is simmering, slowly add eggs, whisking vigorously. Remove from heat and allow to cool for 5 minutes. Pour filling into shells, and place in refrigerator to cool. The crust can be made for many recipes. I tripled crust recipe and filled leftover pastry cups with almond ice cream.